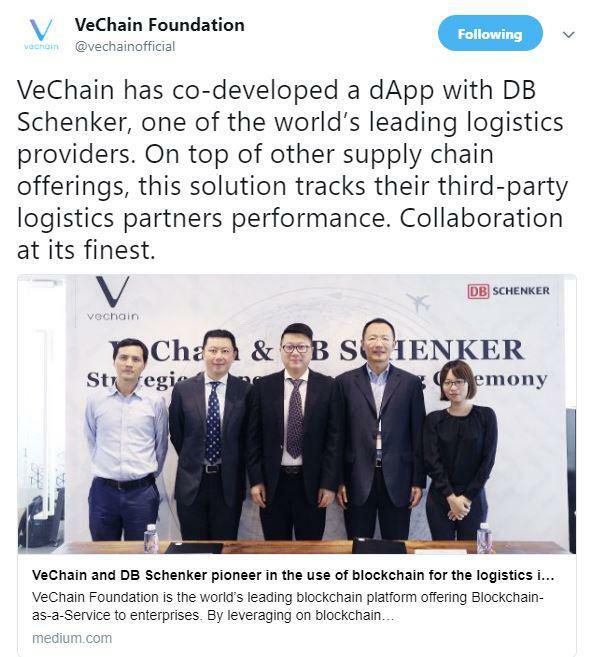 Global logistics giant DB Schenker is to launch a supplier evaluation system on the VeChainThor platform — the first of its kind, according to the Singapore-based blockchain. The decentralized app (DApp) will allow for the tracking of the performance of DB Schenker’s third-party logistics associates based in China, with the criteria consisting of packaging, shipment, and product quality. The DApp is the first blockchain-based program with supplier management uses, according to VeChain. DB Schenker is a global logistics solutions and supply management company. It is a division of the German rail operator, Deutsche Bahn AG that focuses on logistics. This company was created by reorganizing and re-branding Deutsche Bahn. Subsidiaries of this company comprise of a logistics division encompassing air, land, and sea freight, and a rail division made up of European rail freight companies. VeChain has made some big moves recently and this is but one of them. One of the other moves that would elevate it to new heights is its partnership with Liangang, the International Smart Production Fair Trade Center. Also Read: Blockchain in Wine Industry: VeChain To Track Wine Imports For Chinese Wine Industry! Developers from the cryptocurrency startup – Altcoin Exchange – are now open-sourcing technology which allows for automatic trading between the Ethereum and Bitcoin Blockchains. Altcoin Exchange claims this to be the first “atomic-swap” in terms of market value between the two largest cryptocurrencies. The code is now available on GitHub and will facilitate a large number of developers to build their own code on the top of this. By using Altcoin’s tech, developers will be able to lock a certain specified number of Ether tokens in Ethereum smart contracts. Once the tokens are locked, the funds associated with smart tokens will only be sent when the same amount of Bitcoin is sent to a bitcoin address in a specific time window. However, this is still in the experimental stage of its development, but the ability to swap assets between two Blockchains is a first step towards replacing the centralized cryptocurrency exchanges. The existence of such an atomic-swap cannot be considered as a feasible and viable option as on date. The reason being that such one-to-one exchange between Bitcoin and Ethereum can’t be considered a fair trade considering both are trading at different valuations and will even continue to do so in the future. Andrew Gazdecki, CEO of Altcoin Exchange said that the current exercise is only for a demonstration purpose of direct trade and the next step of development will involve transferring of Ethereum to Bitcoin by comparing the two with their dollar equivalent valuations or any other fiat currencies. This means that there is still plenty of work to be done at the back-end before such atomic trades could possibly see the light of the day anytime soon.